Styrofoam (or polystyrene) can be recycled at the Streets Divisoin drop-off sites. Do not place this material into your recycling cart. Madison residents wishing to recycle their Styrofoam must bring it to a Streets Division drop-off site. Please keep in mind that all drop-off site restrictions apply. Bagging Styrofoam in a clear or white bag is not required, but helpful if you have smaller pieces. Bagging helps prevent material from blowing around when delivered to our processor. And, bagging it will help keep it contained in our drop-off sites. The City of Madison hauls Styrofoam to Uniek Manufacturing of Waunakee. 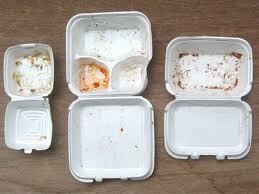 What Type of Polystyrene Can Be Recycled? 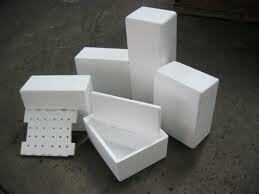 We will accept block polystyrene packaging material. This is the bulky polystyrene that is used around computers, electronics, and other items. 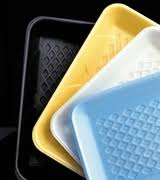 We can also take clean polystyrene cups, coolers, egg cartons and food containers. We can also accept clean meat trays. Here are some examples. We will NOT accept packing peanuts. 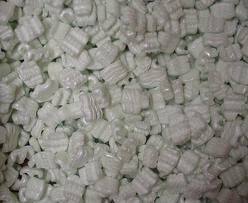 Most packing peanuts are not made of polystyrene so we cannot accept them at this collection. Packing Peanut Recycling Information We also cannot accept dirty material, Styrofoam insulation, or dirty meat trays. Here are some examples of the material we will not accept. The City of Madison has been accepting polystyrene for recycling at our drop off sites at 1501 W. Badger Rd and 4602 Sycamore Av. since March 24, 2012. Uniek also offers a drop off service at its plant 805 Uniek Dr. in Waunakee.You do not have to be a Madison resident to take material to Uniek. Businesses with large volumes of material should call Uniek at 608-849-9999 to make drop-off arrangements. Questions? Contact streets@cityofmadison.com or call 608-267-2626.